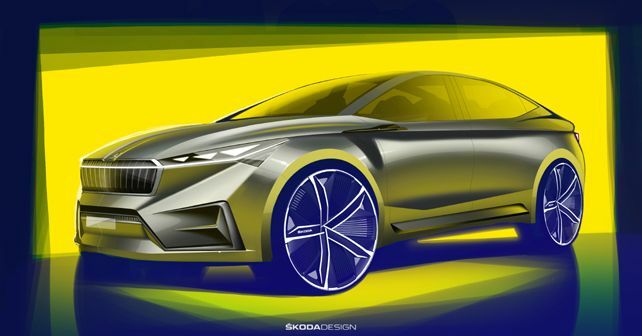 Skoda's latest EV concept study comes in the form of a four-door crossover coupé, which will be on display at the forthcoming 2019 Geneva International Motor Show. Skoda has really been focusing on expanding its concept studies through its 'Vision' line of concept models. While the 'Vision' family started off with the likes of the Vision C, Vision S and Vision E, the latest models that have joined the line-up include the Vision RS and the Vision X. While the Vision RS formed the inspiration base for the new Scala hatchback, the Vision X is said to inspire the upcoming Kamiq. Now, the Czech carmaker is all set to bring its next 'Vision' Concept study to this year's Geneva Motor Show, called the Vision iV Concept. For now, Skoda has let us look into this new four-door crossover Concept with the help of two design sketches that provide an overall estimate of the car's proportions. The important fact here is that the Vision iV stands apart from the rest of its siblings, as it is the first Concept vehicle from the brand to be based on the Modular Electric Drive Kit (MEB). The Vision iV features a reinterpretation of Skoda's usual blend of a wide covered grille, fine vertical ribs and crystalline structures. The horizontal light strip on the upper part of the grille and large air intakes in the front apron give the car its sporty credentials, which is further reinforced by 22-inch aerodynamically optimised wheels and a pronounced coupé-like flowing roofline. Like the Audi e-tron, the Vision iV also junks conventional ORVMs for cameras housed in a shark-fin inspired casing. At the rear, a light strip above the rear spoiler complements the aerodynamic spoiler edges and crystalline LED tail lights. The Skoda badge has been replaced by highlighted individual 'SKODA' lettering in red. While 2019 marks Skoda’s entry into the era of electric mobility, with the launch of the Superb PHEV and a fully-electric version of the Citigo compact hatch (sold in international markets), the brand is indeed committed to add more than 10 electric models by the end of 2022 to its lineup. At this point, Skoda has not revealed any information about the technical specs of the Vision iV Concept, but the production vehicles built on the MEB platform are set to be launched globally sometime in 2020.